Would love to know the details. Dammer going to need to get the buffing wheel out for both the boat and truck. There has to be more to it than just no tie down straps. Did the boat get hit from behind? Edit - I did read the story, and it really doesn't say what happened. That's probably a 7000# boat and with no straps and a quick stop, she's coming on fast. There is very little friction co-efficient on carpet bunks. Scary. I have a hard time believing that. Moving a little is one thing. Ending up over the top of the tow vehicle is something else. You still have the bow stop to go through as well. Plenty of times my boat has slipped back a little as we are coming up the boat ramp, leaving an inch or two between the hull and the bow stop, and I get home and it is still that way. Like yesterday, after towing 250 miles. Maybe I am wrong, but it just seems like there is more to it. As an aside, I like your signature line. I often shake my head in towing discussions. Usually lead by people with what I would consider borderline inadequate tow vehicles. 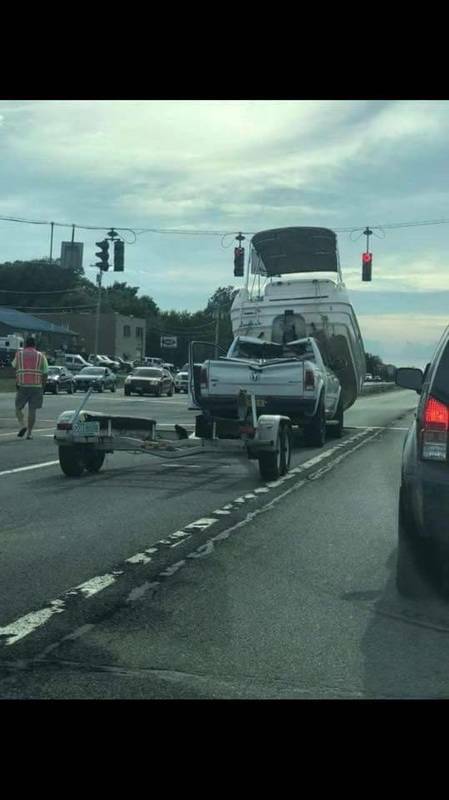 Well, that trailer is a bit nose down. 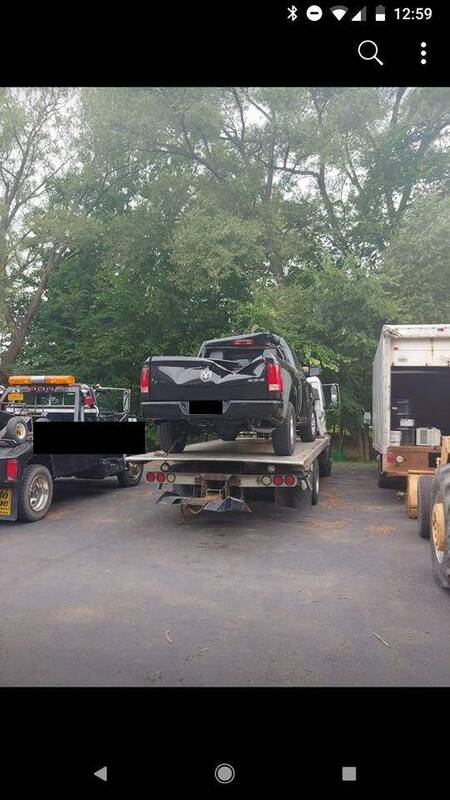 So either he was towing with it that way which would exacerbate the no-friction issue, or the trailer might have broken causing the problem as well. I used to have a 27' cabin cruiser that I hauled around. You had to have the transom tie downs tight, it would move. Have to agree with you... slamming on brakes would not cause this in my opinion either as that would be a heck of lot of inertia to overcome friction, bow strap, and other variables. I did look at picture and guide poles are bent over.. I am thinking rear ended. It kind of looks like the tongue broke, the trailer dug in and stopped and the boat didn’t. Also looks like a salt water trailer, a rusted through steel piece in the tongue and a panic stop at the light. I doubt it would take much speed to get her going off of those vertical bunk boards. At least it was only Dodges involved. Yup, if they had been fords someone would have gotten killed. I am sure Ford got a 5 star crash rating on cabin cruiser over the roof and down the hood, otherwise I wouldn't have ever bought one. Chebbies I've had wouldn't have been able to brake hard enough to cause the issue. This looks to be that accident. No mention of other cars involved, but no definitive explanation. In searching for an answer to this odd one, it isn't so odd. Couple similar wrecks were one-vehicle crashes, while others were rear-ended. I thought given the lack of damage on that boat, it wasn't rear-ended. But looking at some of the other accidents involving a rear-ending offender, the boat wasn't really that damaged from the pics.